Lawyer says he has evidence of their innocence but is afraid proceedings will turn into a political show trial that will prevent acquittal. The Federation of Vietnamese Catholic Mass Media calls on Hanoi to respect its own laws. Two of the eight Catholics set to go on trial for the Thai Ha parish land dispute have not been allowed to meet their lawyers, said one of them, Le Tran Luat. More importantly, he believes that the defendants are not likely to be acquitted despite their innocence because the trial is turning more and more into a political show trial. During an interview with the BBC Mr Le said that he was able to meet only six of the eight people accused with “damaging state property and disorderly conduct” during their protests at Thai Ha parish. 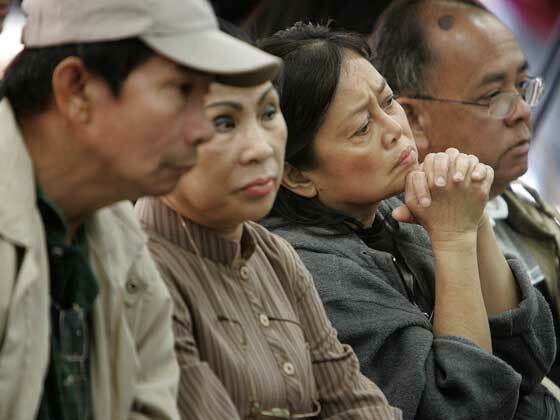 The two defendants he was not able to see are Nguyen Thi Nhi, 46, and Ngo Thi Dung, 54. Both women are being held at Hoa Lo Prison, once known as the ‘Hanoi Hilton’ to US prisoners of war and now infamous for holding political prisoners. Access to this facility is generally limited. “I was denied the permission to visit my clients there,” Mr Le said. However, even if he could see them, “prisoners are often forced to refuse any contact with their lawyers,” he added. Those who do get to see their lawyers suffer mistreatment and punishment by prison guards. For Mr Le from a legal point of view the charge of damaging state property is flawed because he has “enough evidence to prove that the land belongs to them [the parishioners]. Yet, despite his best efforts, “I cannot expect an acquittal verdict for my clients in this case,” he lamented. “In my experience, in such a case, if defendants plead guilty as the government expects, they may get a tolerant verdict. Those who insist that they are not guilty will be sentenced more harshly [. . .], two and half or three years in jail.” But “I want to prove to public opinion that they actually are innocent,” Mr Le said. Hanoi’s Redemptorist community, which oversees Thai ha Parish, is concerned about the fate of the two women, especially Ms Nguyen because she was targeted by vehement attacks in the state-run media for taking part in demonstrations over the former apostolic delegation compound. Never the less, the eight Catholics’ trial is drawing international attention. The appeal is signed among others by Mgr Peter Tai Van Nguyen, director of Radio Veritas Asia (Philippines); Fr John Nghi Tran, director of VietCatholic News Agency (United States); Fr Joachim Viet-Chau Nguyen Duc, director of People Of God Magazine in America; Fr Anthony Quang Huu Nguyen, director of People Of God Magazine in Australia; Fr Stephen Luu Thuong Bui, director of People Of God Magazine in Europe; and Fr Paul Van-Chi Chu, director of Gospel and Peace Radio, Sydney (Australia).